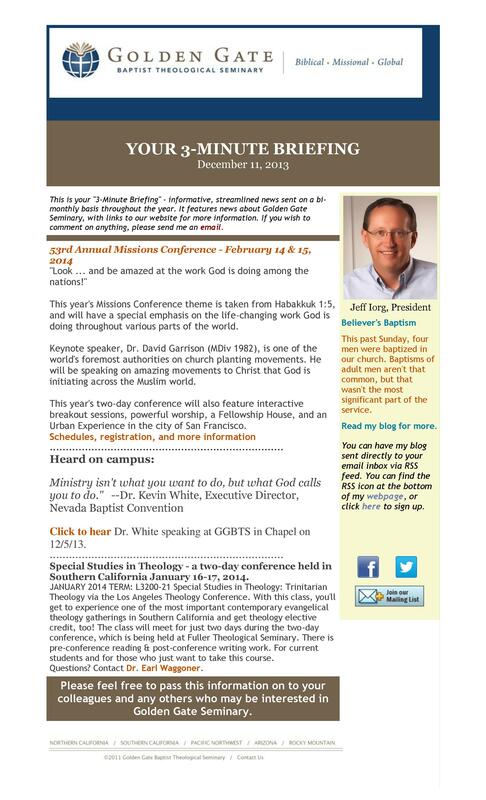 This bi-monthly digital newsletter was ghostwritten on behalf of the Golden Gate Seminary president from 2008-2014. Phyllis created, wrote content, and distributed via email marketing software program Constant Contact. Written for graduates, donors and prospective donors, as well as pastors and church members all around the country, the purpose of the newsletter was to inform readers of the various degree programs, major events, awards, new faculty, and other Seminary-wide news. The format was to share a short explanation and link to the complete story and information on the Seminary’s website. The challenge was to keep the newsletter interesting, brief, and fresh. This was done by including quotes from faculty, guest speakers, and others, as well as references to the President’s weekly blog.